Support the 10th anniversary of Fairtrade Fortnight (1-14 March) and try some Fairtrade ingredients in the kitchen - look out for the special symbol (see below, left) on packs. 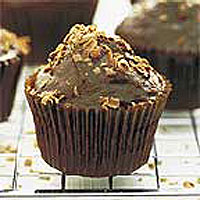 These muffins are easy to make and will impress both children and adults. And there is a bonus - hidden inside is a gorgeous gooey centre of creamy chocolate ganache. Preheat the oven to 180°C, gas mark 4. Line a deep 6-hole muffin tin with paper muffin cases. Place the butter and chocolate in a heatproof bowl and place over a pan of simmering water until melted - do not allow the bowl to touch the water. Remove the bowl from the heat, stir in the sugar, then gradually beat in the eggs. Fold in the flour until smooth and combined. Spoon enough of the mixture into the muffin cases until each one is half full. To make the ganache, place the chocolate (reserving two pieces for decoration), cream and coffee in a heatproof bowl and place over the same pan of simmering water - do not allow the bowl to touch the water. Once the chocolate has melted, remove from the heat, stir thoroughly and allow to cool slightly. Spoon half a teaspoon of the ganache into each muffin case, then top up with the remaining muffin mixture. Bake for 20-25 minutes, or until springy to the touch. Transfer the muffins to a wire rack, and while still hot, top each one with the remaining ganache, smoothing it with a round bladed knife. To decorate, grate the reserved chocolate over the muffins. Serve warm or cold. The muffins will keep for up to 2 days in the fridge. Cook's Tip: The ganache mixture will set as it cools. Before icing the muffins, return the bowl to the pan of simmering water until the mixture is smooth and spreadable. Get ahead: Make and bake the muffins without the filling, then cool and freeze in plastic freezer bags for up to 1 month. To serve, thaw at room temperature, then make half the quantity of ganache to decorate.